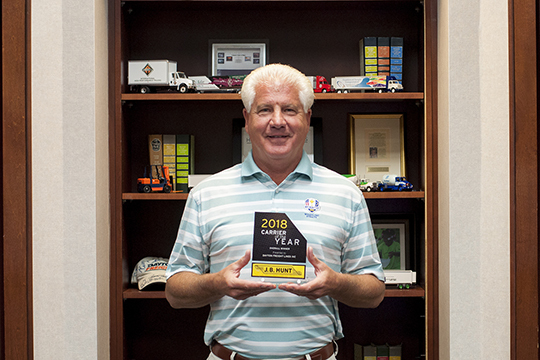 J.B. Hunt, for the third time, has selected Dayton Freight to receive its 2018 Carrier of the Year Award. We are being recognized for our superior performance in on-time pickup and delivery, customer service, EDI compliance and carrier responsiveness. We are grateful and humbled by this award, and appreciate our business partnership with J.B. Hunt. Dayton Freight employees are to be commended for their dedication to serving J.B. Hunt, and showing them The Dayton Difference. J.B. Hunt, a Fortune 500 company, is one of the largest transportation logistics companies in North America. Utilizing an integrated, multimodal approach, they provide capacity-oriented solutions centered on delivering customer value and industry-leading service.